Taipei has been craving salads and sandwiches, proven by the busy lunchtime crowds at Dressed since opening only a few weeks ago. 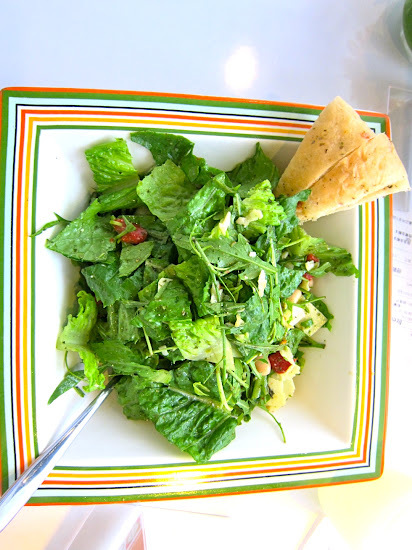 Okay, I have also been craving a great salads and sandwiches place, and missing my LA spots like Tender Greens or Souplantation. 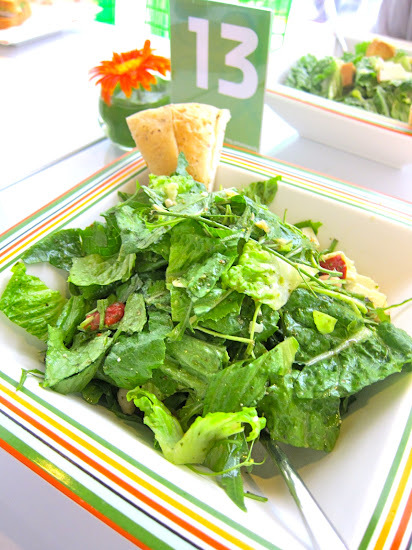 For years, I have been wistfully wanting heaping plates of fresh arugula or baby spinach, topped with soft cheeses and slices of juicy grilled meats and things like sweet sundried tomatoes, chunky avocados and sunshine colored beets that I'd often eat in LA. 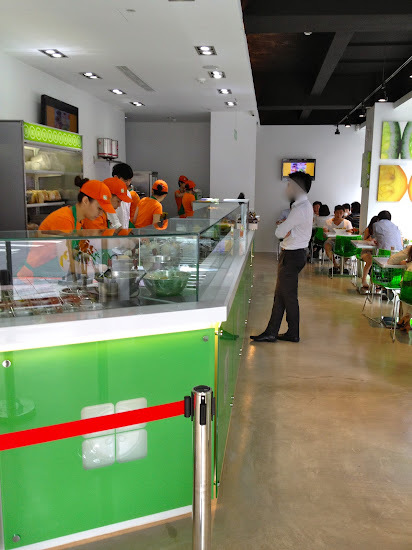 The cafe is clean with lots of bright primary colors- green, orange, red, echoed in the everything from the decor and uniforms to the logo and lines on the plates. 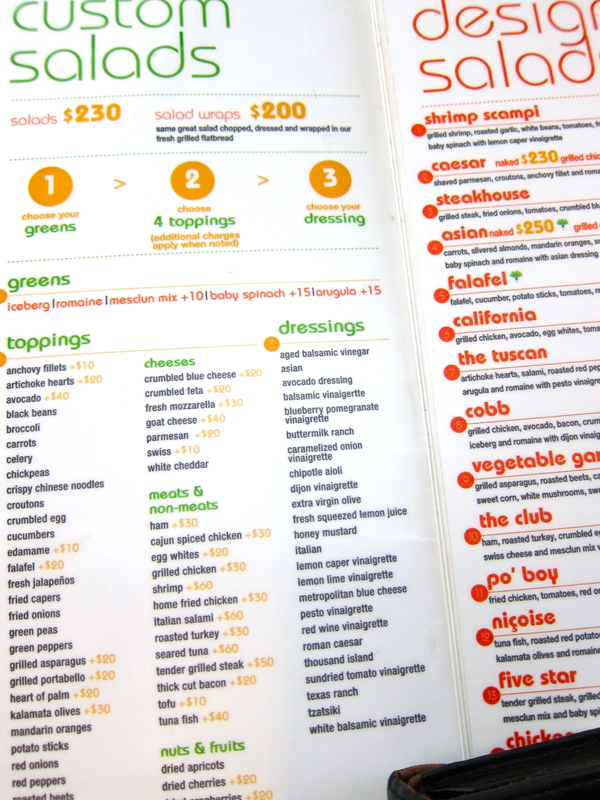 Restaurant color psychology and marketing dollars in action? For first timers, the menu can be overwhelming. 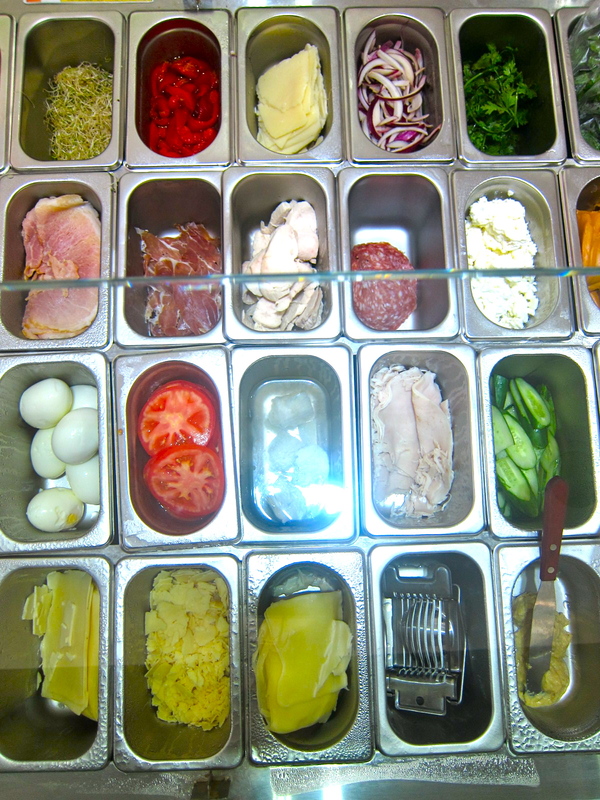 Even though the menu only has sandwiches, paninis and salads, there's a lot to choose from. 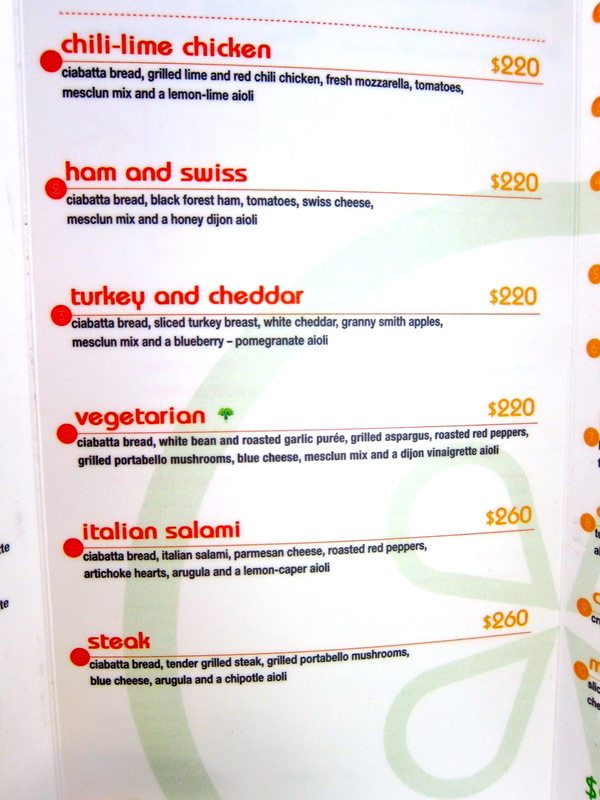 There's 18 choices for "Chef designed" salads (NT$260-350), as well as the option to create your own salad with iceberg, mixed greens, romaine, baby spinach or arugula as a base, then choose 4 from almost 50 topping choices like beets, salami, goat cheese or even dried cranberries and then a dressing. Premium greens and toppers come with an additional cost to the base price of NT$230 and salads can be made as custom wraps as well. There's also hot panini sandwiches and about 10 cold Artisan sandwiches to browse. The prices are not cheap, but they are still cheaper than quite a few sit down Western cafes and restaurants. Decisions, decisions. My first time to Dressed, I ended up ordering a Cobb Salad and a Steak Panini to share with a friend. I ordered on one side of the counter and then walked to the end of the counter to pay, carrying my order sheet. You can see the salads being made and chopped up into bite sized pieces with efficiency, and a lot of people behind the counter busy measuring, assembling, chopping, grilling, and blending. 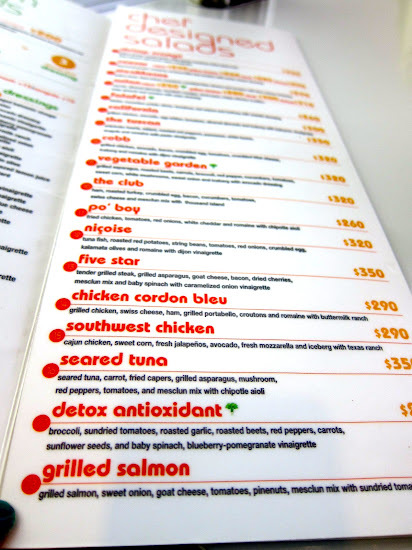 I suppose if you had a hard time deciding off the menu, you could also order by pointing at items at the counter since everything is in sight. They might also give you a more hearty portion if you are standing there, as I spotted on my last visit from a neighboring customer. Near the cashier, there are premade paninis for toasting and fresh juices, canned sodas and chips are available, while smoothies are made to order. Once you pay, you get a number to take to your table (if you can find one). If you have a more complicated order, like a custom made salad, you should check your order sheet to make sure that it's the right order since I've had a couple orders gone awry. For example, if I had looked closely at my order sheet, I would have caught that they made my Cobb salad into a wrap which I didn't ask for, but there was probably some confusion since I was going to make a custom wrap and then changed my mind and got a Cobb instead. First to arrive was my Peach smoothie (NT$150), which was a smooth consistency and the right amount of sweetness. 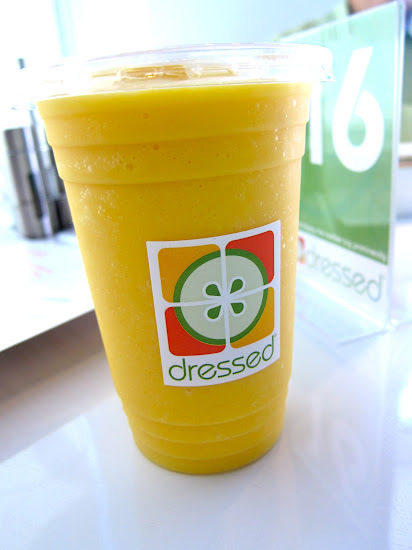 If you've been missing Jamba Juice, you'll love Dressed's smoothies. When I ordered a second smoothie, I noticed on the menu that some of the smoothies include simple syrup, which is basically sugar water, so that they don't rely on the natural sweetness of the fruit or add something like apple juice. So if that bothers you, you can request to leave it out but then the smoothie will not be as sweet. They also puree many of the fruits and ingredients beforehand, so that they are measuring everything from squirt bottles, which is kind of a strange sight, but I suppose makes sense for speed. 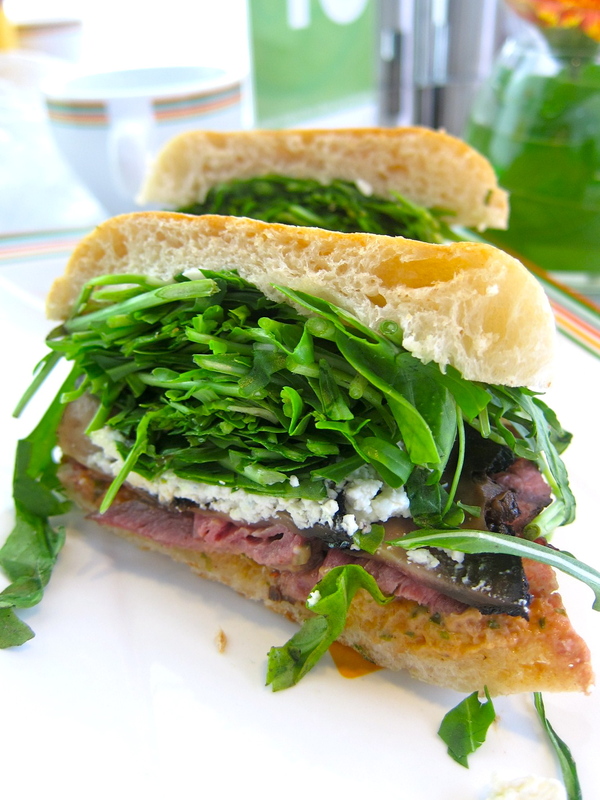 Then my Steak panini (NT$260) came, bursting with arugula. I loved the flavor combination, with the zesty arugula, creamy pungent goat cheese, spicy chipotle dressing and tender steak. The ciabatta bread was really good, with a soft crunchiness from being toasted and not too dense and heavy. I just wished there was a tad more steak, but I inhaled my half of the sandwich. Oh arugula, how I've missed you so. 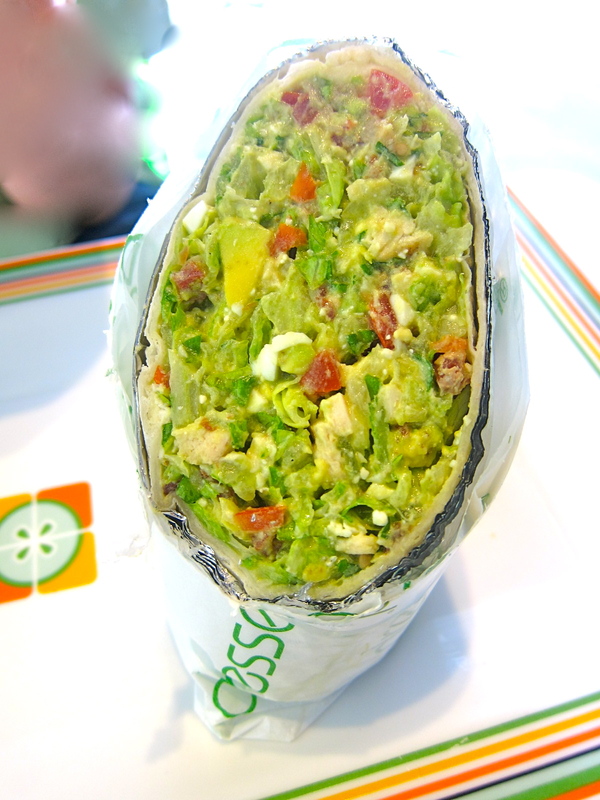 I was surprised to see my Cobb salad as a wrap, but it was still chock full of avocado and tomatoes and speckles of hard boiled egg. One thing I think Dressed could do is not wrap the wraps in so much aluminum foil (there must have been at least 4 layers), but I know it helps keep the shape of the wrap. Maybe just two layers since there's also a plastic wrap layer outside? The wrap was a fairly decent size and fat, and while there wasn't a ton of chicken in the salad wrap, the mix of ingredients was enough to keep me distracted. And it was actually quite creamy from the avocado despite me having asked for the dressing on the side (thinking I was getting a salad). On my second visit, I was excited to share the new spot and brought along a few girlfriends. We managed to grab a big table in the back and started to order. I know that Dressed is very new, so they are still working out the kinks- we had a couple of wrong orders and missed orders as well- so again, check your order sheet. 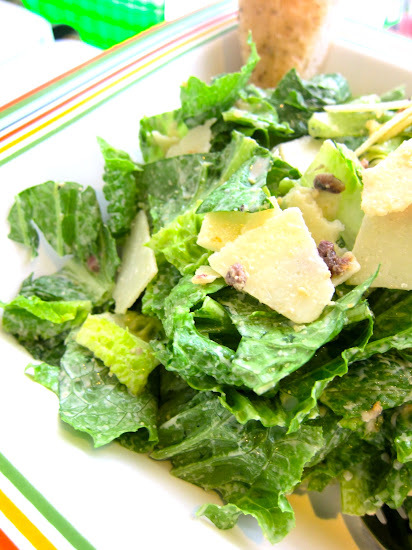 One of my friend stuck with the classic Caesar salad (NT$230). I ended up wanting to try a Custom salad (NT$220 base price). I ended up choosing arugula (+NT$15) with beets, steak (+NT$50 ), red pepper and sundried tomatoes (+NT$ ). 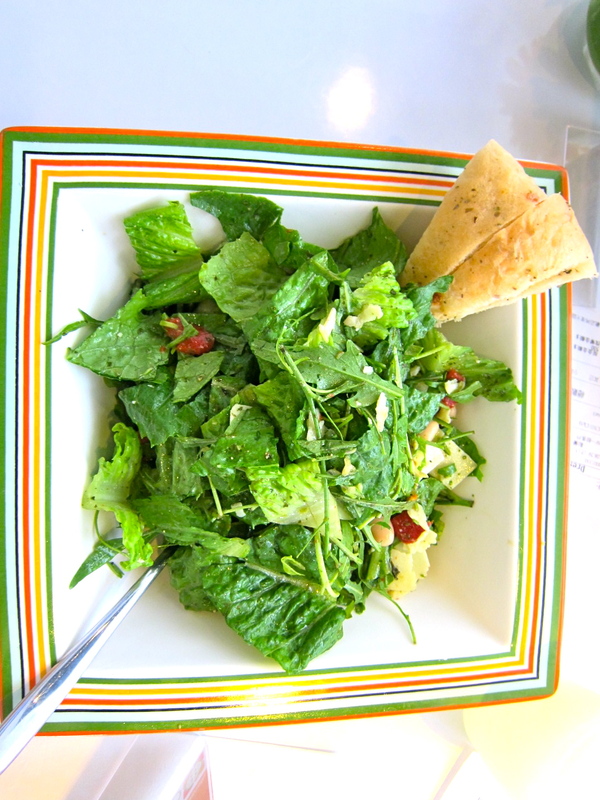 The green salad portion is quite large, enough to share between 2-3 people as a side, or split into two meals, but I was disappointed in the toppings. Especially since I had to pay extra, like for the steak, I expected to be able to see it, even if it was mixed together and not laid atop. 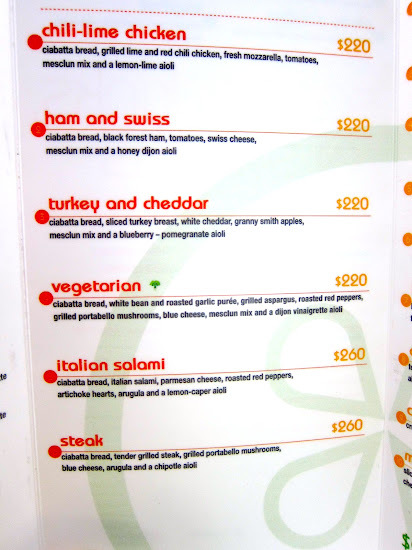 I'd rather get a panini for a flat price and not pay more for less protein. 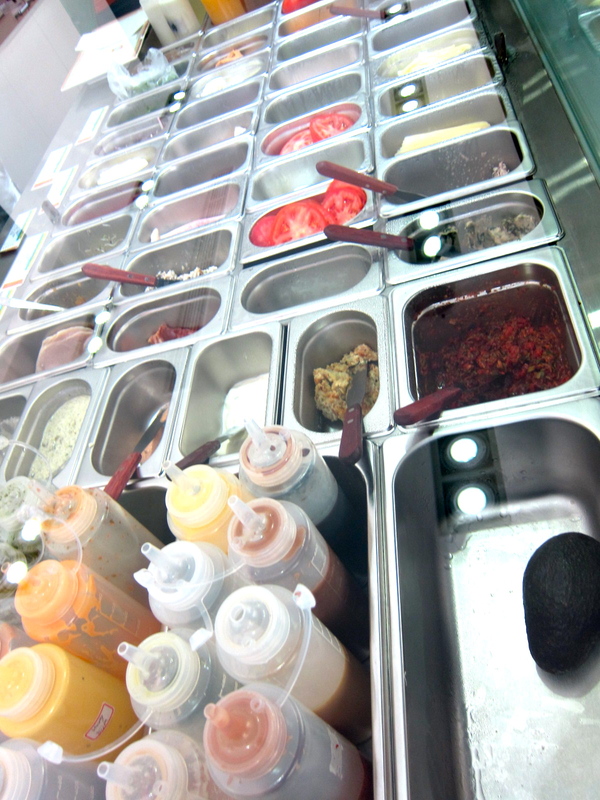 It was hard to find more than a few morsels of each topping and the tiny pieces of steak were cold. It made me miss my favorite salad place in LA, Tender Greens, even more since their salads came with huge slices of hot medium rare grilled steak or big chunks of chicken and avocado in their Cobb (and at a similiar price point). 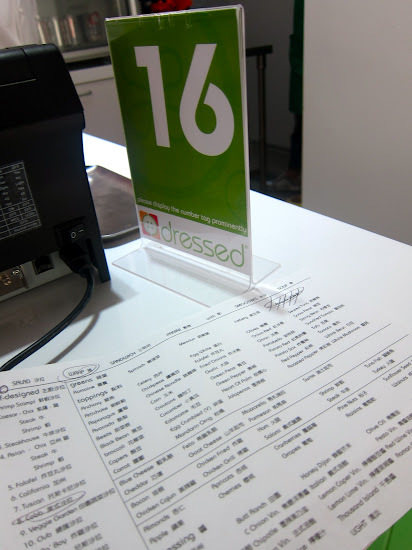 I had my expectations raised by my previous positive experience and in terms of customizing my own salad, I wanted more from Dressed. I couldn't eat it the way that it was, so I asked for a box and boxed it to-go so I could take it home and add more stuff to it for dinner. On my third visit, I mentioned my disappointment to the guy at the counter, and he responded in perfect English, "let us make it up to you" and offered to make a better salad, noting that they had only been opened a few weeks. 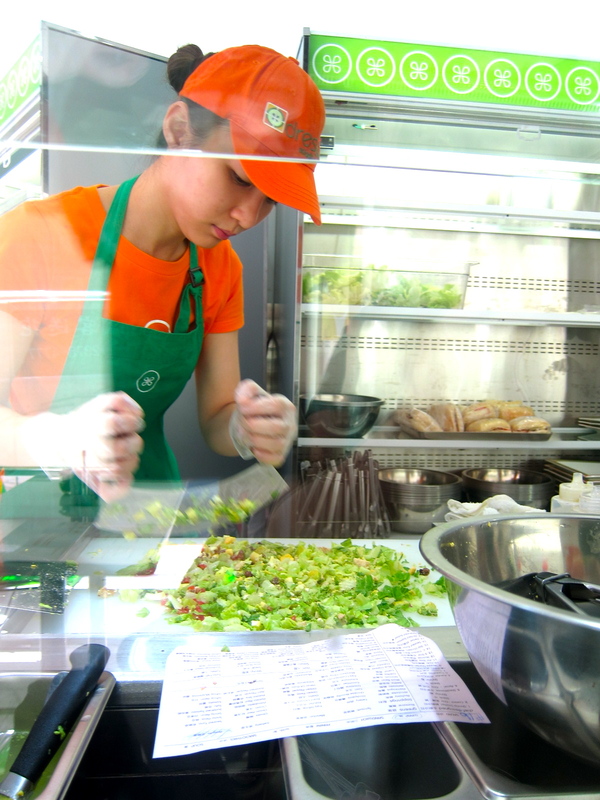 It was the thought that counted, the desire to make the customer happy instead of a weak "bu hao yi si" that ensures that Dressed will thrive and hopefully improve and help good salads become a staple in Taipei diet. I didn't take his offer that day, but hopefully they can tweak the toppings portions so that it will be as hearty as the chef designed salads even without complaints from previous visits. 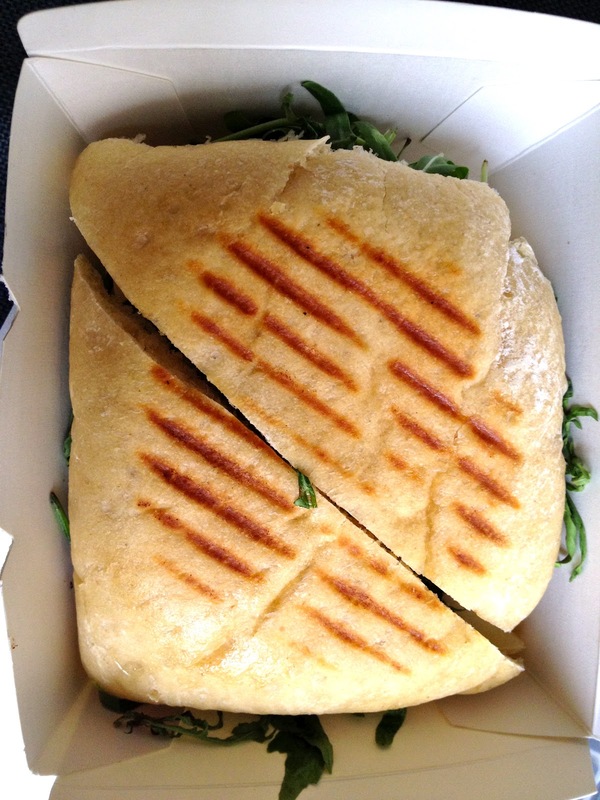 And my to-go Salami panini (NT$280) with peppery arugula, briny artichokes, salty parmesan cheese and sweet roasted red peppers from my third visit was delicious. The to-go box fit the sandwich perfectly and was cut into triangles for easy eating on the go. Who knew you could put artichokes in a sandwich? I'm totally stealing that idea. I know word of mouth for Dressed will be crazy. With the opening of the also new 1Bite2Go, maybe sandwiches and salads will be the next craze to hit Taipei? OMG! I was totally there too! I lurvs that place, but it's just so pricey (for TW). Apparantly, it's opened by the same chain that's based in Atlanta. Just dropped by but apparently traffic has cooled down. Only 3 people there. Great setting and food but I have to agree with MstrChang, it's a bit pricey for TWN. Thank you for reviewing this place. When I'm craving something healthy but delicious, this is exactly what I've needed! Checked it out the other night, and it was pretty empty in the evenings, but I hope they are staying busy during the daytime! I drove by it a few weeks ago and the cool look caught my eye- my friend and I went for lunch last week. It was crowded at lunch time and the sandwiches we got were awesome, can't wait to go back and try the salads!! 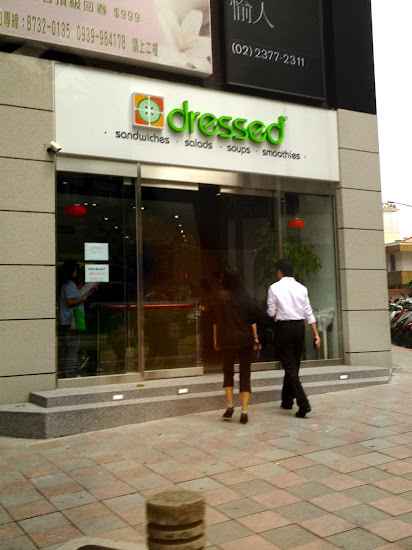 With this choice of sandwiches and salads, "Dressed" sounds like a perfect place for me, as I tend not to be that hungry in Taiwan's hot and humid climate. I should really try this one out the next time I stay in Taipei - hopefully next spring. Thumbs up for your revies of "Shintori", an upscale Japanese restaurant, from Octobre 2010. An amazing place really. MstrChang/Anonymous: yes pricey for Taiwan, but has some good stuff that you can't really find in Taiwan. L Gerock: thanks for commenting! : we'll see if people will keep going back! DA: thanks for commenting! 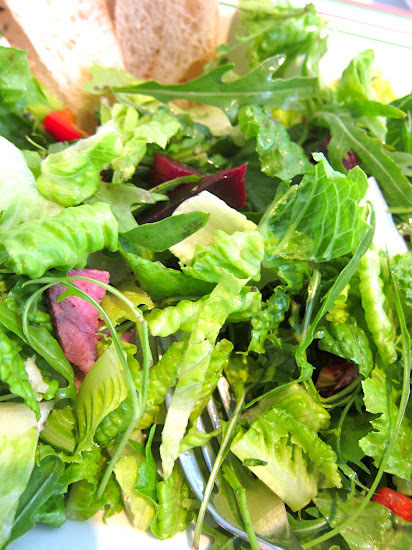 let me know if you like the salads too! Mudstud: thanks for commenting! I'm glad you liked Shintori too! Not bad, but pretty pricey compared to alternatives like Saladay. 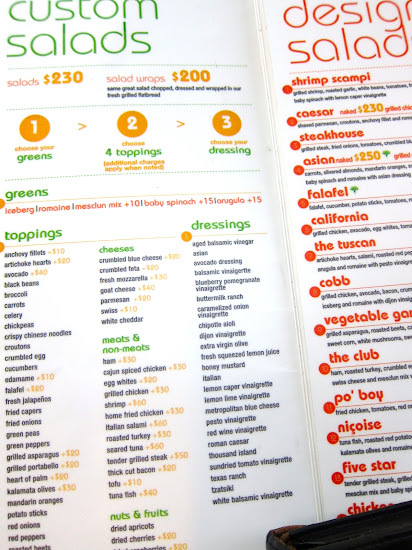 To get something comparable you're looking at almost double the price, plus they really do skimp on salad toppings. Sandwiches seem to be a better deal.